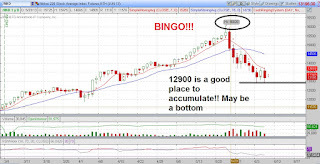 Daniel Loh: Nikkei Bottom at 12816?! Accmulate? 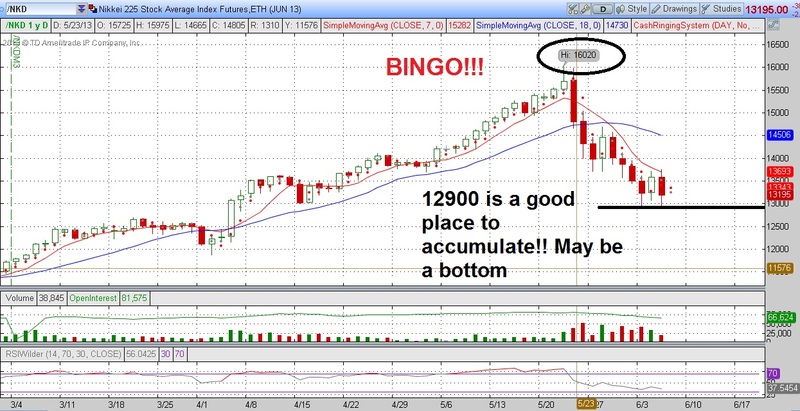 Recently we are looking at Nikkei closely, as we correctly predicted its TOP at 16000. Having said that, what is the direction of the Nikkei now? We think that the bottom is near or about there. Now it is 13210 points. We feel that anything below 12816 is a bonus gift! For the courageous, 13000 is pretty good a place to accumulate up. Having said that, we also believe that it might take at least 6-9 months for Nikkei to regain 16000 again. For those who want to bet on Nikkei reaching new high again may have to wait a while as the QE effect is over for now. Today's Abe new proposal did nothing to lift the index.